Scientists using Hubble Space Telescope have measured the age of what may be the youngest galaxy ever seen in the universe. By cosmological standards it is a mere toddler seemingly out of place among the grown-up galaxies around it. Called I Zwicky 18, it may be as young as 500 million years old (so recent an epoch that complex life had already begun to appear on Earth). Our Milky Way galaxy by contrast is over 20 times older, or about 12 billion years old, the typical age of galaxies across the universe. This "late-life" galaxy offers a rare glimpse into what the first diminutive galaxies in the early universe look like. The galaxy is a member of a catalog of 30,000 nearby galaxies that Swiss astronomer Fritz Zwicky assembled in the 1930's by photographing the entire northern sky. Though astronomers have long suspected that this galaxy was a youngster, due to its primordial chemical makeup, Hubble's exquisite sensitivity allowed astronomers to do a reliable census of the total stellar population in the galaxy. This allowed them to reliably identify the oldest stars inhabiting the galaxy, thereby setting an upper limit on the galaxy's age. The baby galaxy managed to remain in an embryonic state as a cold gas cloud of primeval hydrogen and helium for most of the duration of the universe's evolution. As innumerable galaxies blossomed all over space this late-bloomer did not begin active star formation until some 13 billion years after the Big Bang, and went through a sudden first starburst only some 500 million years ago. Located only 45 million light-years away — much closer than other young galaxies in the nearly 14 billion light-year span of the universe — I Zwicky 18 might represent the only opportunity for astronomers to study in detail the building blocks from which galaxies are formed. It remains a puzzle why the gas in the dwarf galaxy, in contrast to that in other galaxies, took so long — nearly the age of the universe — to collapse under the influence of gravity to form its first stars. "I Zwicky 18 is a bona fide young galaxy," said Trinh Thuan, professor of astronomy at the University of Virginia, who co-authored the study with Yuri Izotov from the Kiev Observatory. "This is extraordinary because one would expect young galaxies to be forming only around the first billion years or so after the Big Bang, not some 13 billion years later. And young galaxies were expected to be very distant, at the edge of the observable universe, but not in the local universe," Izotov said. The finding, reported in the December 1 issue of the Astrophysical Journal, provides a new insight into how galaxies first formed. The galaxy I Zwicky 18 offers a glimpse of what the early Milky Way may have looked like 13 billion years ago. Another set of Hubble observations by a different team give a slightly older age of 1 billion years to the galaxy, still keeping it a comparative newborn. 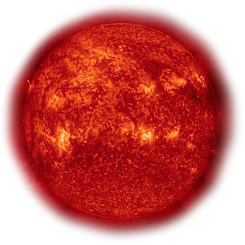 Goran Ostlin of Stockholm Observatory, and Mustapha Mouhcine of the University of Nottingham, used Hubble's Near Infrared Camera and Multi-Object Spectrometer to find a population of cool red stars, which are slightly older than the stars seen by the Advanced Camera for Surveys Camera. The results are to be published in Astronomy & Astrophysics. To prove that I Zwicky 18 is a new galaxy, Thuan and Izotov needed to show that it was devoid of stars from the first several billion years after the Big Bang, the period when a large fraction of stars in the universe were formed. Though astronomers had suspected that the galaxy was exceptionally young, they had to wait for Hubble to provide the needed sensitivity to detect whether or not older stars, faint red giants, existed within the dwarf galaxy. Hubble's Advanced Camera for Surveys needed a very long exposure, requiring 25 telescope orbits to look for the faintest stars in the galaxy. The presence of old stars in the galaxy would have indicated that the galaxy itself was old, like all other known galaxies in the universe. Large galaxies such as the Milky Way are thought to grow hierarchically, with smaller galaxies merging into bigger galaxies, like tributaries merging into large rivers. 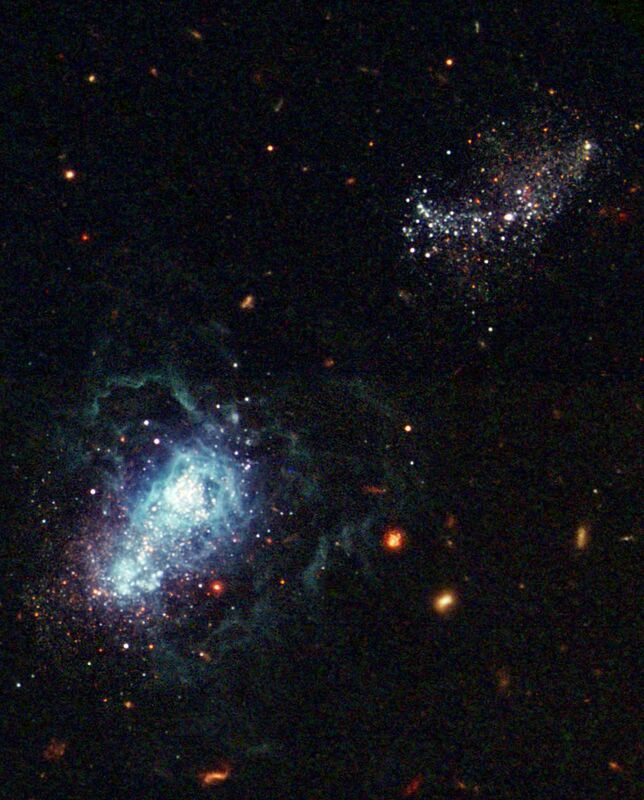 I Zwicky 18 is prototypical of this early population of small dwarf galaxies. "These building block dwarf galaxies are too faint and too small to be studied without the most sensitive instruments even in the local universe, let alone in the far reaches of the cosmos," Thuan said. Further evidence for the youth of I Zwicky 18 is the fact that its interstellar gas is "nearly pristine," Thuan said, and composed mostly of hydrogen and helium, the primary two light elements created in the Big Bang, during the first three minutes of the universe's existence. The dwarf galaxy includes only a sprinkling of the other heavier elements such as carbon, nitrogen, or oxygen that are created later as stars develop. The near absence of such heavy elements suggests that much of the primordial gas in the dwarf galaxy has not managed to form stars that subsequently manufacture heavy elements.